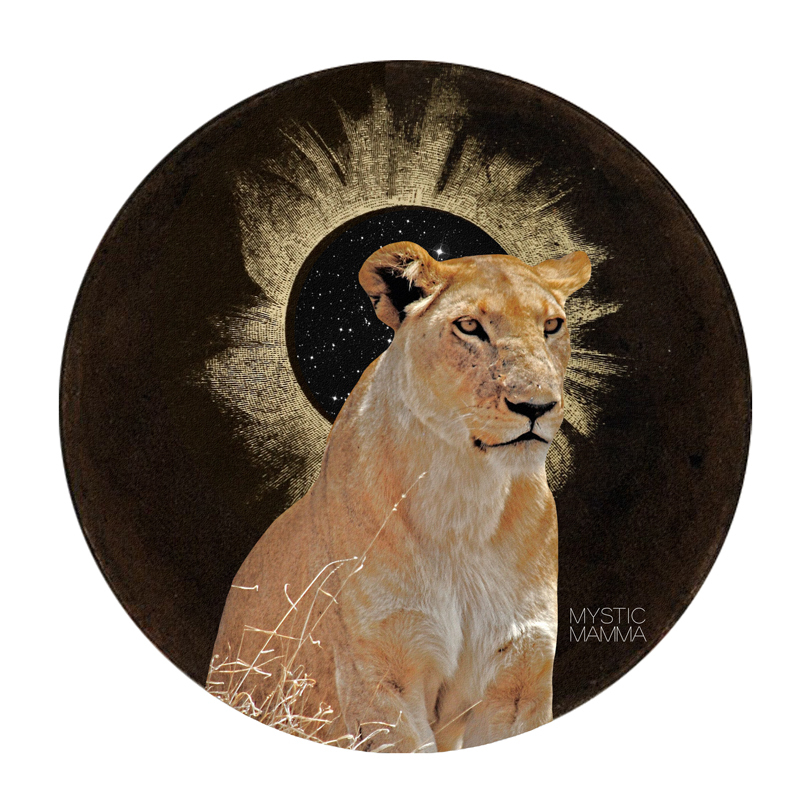 *NEW MOON* Solar Eclipse in Leo. Oh the power of presence. Our presence = our power. In each moment we live we have the opportunity to stand in it. Truly stand. Our Lion heart is so big. Our need to connect and feel loved is so strong, but sometimes looking for that external validation is what trips us. Our inner Queen and King remind us to abide in the heart of Love. Roar who we are relative to Creation. Feel in our body that we are worthy and wonderful. With compassionate love for Self, respect for Self and trust in Self, we can safely stand as Queen and King of our own jungle. Our inner well is continually filled through our connection to the land and this animate universe that we are part of. Once we are filled from that inner well we can step forth with maturity, poise, and a compassionate open heart ready to hold our pride. When we anchor that acceptance from within, we create a sense of safety that allows for all to come out and play so together we can revel in the deep passion of Life. Here are the MYSTIC MAMMA Astral Insights from our beloved featured luminaries. “At a solar eclipse, the Moon (the unconscious) takes bites out of the Sun (consciousness/ego), eating away at it until we’re in the dark. “With the light switched off, it’s like a cosmic power cut and we’re left fumbling around looking for candles. “Often, we’re uncomfortable in the dark. Things look different. Shadows merge together to form strange shapes and nerves tingle as we try to figure out what exactly we’re seeing. “The Moon and Sun are closely conjunct Pallas, goddess of pattern recognition, wisdom and strategy. “She counsels us to keep a cool head and watch for creative, intelligent design at work in our lives. We too can see patterns if we stop and look carefully. “When we move between light and dark, the first thing we must do is let our eyes adjust instead of blindly grappling for purchase. “Chatty Mercury, also conjunct this eclipse, is uncharacteristically quiet. ‘Listen’ is all he has to say. “Our hearing becomes more acute in the dark to compensate for our eyes. “With so many planets retrograde, the Cosmos appear to be impressing upon us the necessity of tying up loose ends on many levels, before we can fully embark on the next stage of our journey. “A Yod formation also plays a significant role in this eclipse. “It’s easier to spot outer restrictions than inner ones. “We’re usually so close to the beliefs underpinning our self-image we have zero objectivity. It can be impossible to see ourselves as anything other than who we think we are. “This blind-spot is the source of our greatest limitation. We can defy the restrictive expectations of the outside world all we want, but if we can’t perceive where we suppress ourselves we become our own oppressor. “Uranus retrograde says it’s time to stand back, take an objective view and question the most fundamental assumptions underpinning our identity. “Why is it so important to see ourselves a certain way, be acknowledged for particular qualities or define ourselves as we do? What do we gain and what do we lose? What’s really going on? “And most importantly, what would happen if we dared let even our most treasured identity be blown to smithereens by Uranus’s liberating power? “If we follow this lead in the coming months fear of change can dissipate, the terror of non-acceptance subside and the oppression of ‘what will they think?’ diminish, deferring to a richer engagement with life’s ups and downs. “Uranus’s square to Mars in Aquarius emphasizes the importance of detachment from the reactive emotional charge triggered by threats to our self-image. “If an aspect of our identity both limits and defines us in equal measure, letting it go may threaten the very fabric of our life. “Facing the void that follows its demise can trigger intense fear, and there’s no shame in this. “Deep-rooted change unsettles us to the core, challenging all we’ve relied upon to face the world each day. “Softening around our self-beliefs, entertaining the nuance of ‘maybe I’m not who or what I thought’, creates space for new perspectives. “If the contraction of past trauma and unhealed pain clips our wings in the present, the coming months will allow us to tend these wounds. “The final of three eclipses since mid-July, this one both consolidates and facilitates embodiment of the changes demanded by the other two. “Aspecting Pluto, it affirms that what looks like destruction is the beginning of new life and references the primordial chaos from which all beingness is born. “As we awaken we encounter this chaos as the rising of our shadow self: those thoughts, feelings and impulses we’re mobilized to avoid. “Just as an abscess must discharge in order to heal, so must we allow the full force of our instincts to arise into consciousness. “This process of inner rectification challenges us to ever greater levels of self-acceptance. “We are not made ‘spiritual’ by identifying only with positive emotion and loving intent. “Denial of the shadow is not an act of wisdom but of inner subterfuge, designed to protect the fragile ego which cannot yet accept the truth of who we are. “With so much polarization occurring on the world stage – violence, narcissism and protectionism at the highest level – it’s easy to lay claim to the moral high ground and yes, it is important to call out abuses of power for exactly what they are. “But it’s equally important to look within at our own feelings of superiority, hatred and intolerance. They’re the ones we have power over, the ones we can actually change. “This solar eclipse strengthens us to acknowledge and embrace them, curtailing the chaos wrought when they’re denied and ignored. “Many will be relieved to know that the eclipse season comes to an end on 15th August, as does the square between Mars and Uranus which has stirred up trouble in the past three and a half weeks. “This easing of what has been a considerable amount of pressure for quite some time may feel disorienting at first, as if we’re missing something or have overlooked an important task that remains undone. “It may take a few days for us to settle into this more low-key ambience, but as we do we’ll begin to feel the impact of a trine between Saturn and Uranus which will make its supportive presence felt until the end of September. “This trine may come as an answer to many prayers, allowing us to translate recent inner shifts into external change. “It takes courage and faith to go against the collective rules of society, to stop giving into the fears it provokes in us. “A solar eclipse is an extra powerful New Moon that weaves together our solar consciousness and our lunar consciousness. It signifies a new beginning. “It’s a time to plant seeds that will blossom in the next year. “LEO 19: A hummingbird feeding at a trumpet vine. “Heightened perception exquisitely poised, brilliant and as fast as can be. “You have the genius of seeing things, knowing things, being there. Overflowing with destiny-bounty earned over many lifetimes, yet you bring all this through with a fine-tuned ability to land in the situation at hand with only as much as can be worked with. “You are guided to follow an extraordinary course through the world, which features the perfect opportunities to tap what is inside in so many different ways. The blessings, the grace, the heart’s wonder are super full. “As this way of being ripens and matures, it becomes even better. Then you begin to draw out from others the same kinds of marvels and wonders, and to make it possible for the vibrancies to spread and grow. Absolutely beautiful!!!! These messages just reaffirm that I’m exactly where I need to be. I can’t thank you enough. This is my daily motivation! Really beautiful and insightful. Thank you! Yes, Susan, I agree. Beautiful saying to live, love, and work by. Thank You for this MysticMama… I’ve been feeling the Energies building so have been working on My Inner Self and Journey/Ascension/Twin Flame💕🔥 and karma. I have FAITH that Beautiful Things are in store for Me and my Pisces Double Aries w Taurus in my Venus Self… lol. Namaste. Mystic mama, Ellias Lonsdale appears to have copied “his” interpretation of the Chandra symbol straight from a very popular astrologist : Lorna Bevan at Hare in the moon astrology based in the UK who published these exact words on Sunday August 5th. Takes a lot of nerve from Ellias to claim copy right since “his” interpretation is copied word for word from Lorna. Disappointing to say the least and I definitely can not take him serious as a professional! Dear Heike, this is 100% from Ellias Lonsdale. She was quoting him. She used quotations but did not mention his name. They are part of his creation of “Star Sparks” which are his readings of the Chandra symbols that were created by John Sandbach. LEO 19: A hummingbird feeding at a trumpet vine. So interesting how information gets warped and twisted. Somebody using his words without citation and he is being accused lol. What strange times we are in. I can definitely say he is most definitely the visionary who channeled this wisdom. Thank You for all your are doing… you have been a bright path for me and I have shared your sight with so many people. so many kisses! Thank you. This amazing collection of wisdom and insight opens doors and windows in the minds, hearts, souls, and wills of everyone who reads it. The chalice of change is offered. We have but to accept and drink deep. Then let the magic work, mobilize our will, and initiate and do the good that it is ours to do. Happy, profound working to us all. Thanks to all those that contributed to this insightful New Moon Eclipse edition. Love and blessings, as always. Thank you! I enjoy reading these! Much Love to all! Well, I admit it, these eclipses have been a bit rough. I do think this one might be easier and then we can really relax a bit. That will be a relief! Thanks to MM and these talented astrologers! MM, you continue to both ground me and lift me up with your beautiful words of profound insight and wisdom. Along with all of the generous offerings that you curate from so many gifted individuals – truly your work to share so much beauty is a centering force in my life as I find my way along my path to my own truth so that I may also share the light! So much profound gratitude to you and all that you are, as you help me discover the same within myself! .. wanted to add that in one dream from the other day .. while surrounded by people/situations from the past, there was a deep dark pool of water and a huge red sea snake emerged, resembling a cobra/mythical creature and it looked directly at me. although scared I stood still and looked at it .. contemplating what the message was: deep, dark emotions (water) and serpent – rising power/energy ? Love to hear your read on it .. So incredible. My favorite part was your intro – it brought me to tears. There has been generations and generations of junk piled into our DNA, obscuring the light we carry within – the Godspark. Now is the time for the uncovering – the revealing of our pure, true and untainted selves. Blessings to all of us – that we gently uncover and grow into all we are meant to be.